Everyone has his own superhero who is the main idol. Someone likes Captain America, others like villains who want to destroy the whole world, but one way or another, comic book characters are an important part of people. There are mods for any popular game that add such superheroes and their some super abilities. It's time to add these unusual people (and not just people) to Minecraft PE. The Pocket Heroes mod contains more than 20 comic characters listed below. It is important to note that at the moment this is the most multifunctional and advanced thematic mod. You are unlikely to find anything better, although there are alternative addons, but their capabilities are limited. I think it makes no sense to describe the super abilities of each hero individually, since you yourself know perfectly well what each of them can do. You need to pay attention to the beginning of the game, because if you play survival then you definitely need to know where and how to get the elements of the suits. Probably you will be surprised but the Pocket Heroes mod does not allow you to get everything right in the survival (you can use the creative mode but with it you will not feel the epic). To get this or that suit or weapon, you need to defeat one boss after another and then pick up the drop. So, get the next thing - Start Something Epic (see recipes) and tap on the ground. Then add the desired item and get your first boss. In this way, you can summon a new enemy by getting new items. This is not so easy as it is written, because each subsequent boss has a large reserve of strength and health and can make different tricks. For example, your third opponent will not fight alone, serious friends will come to his aid. 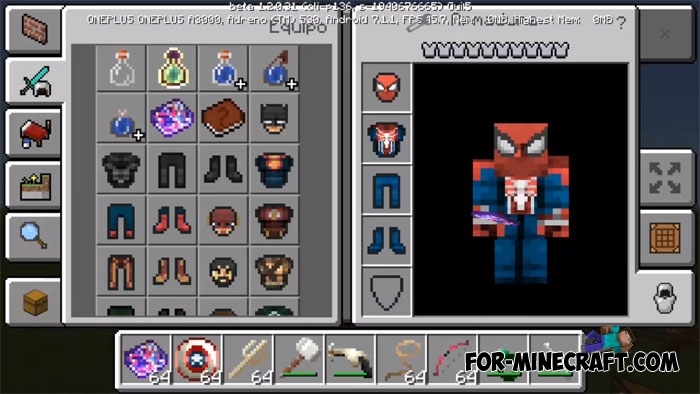 And some information about super abilities: each superhero has those or other features that will become available to you only after you completely assemble and put on his suit. After there are new buttons on the screen, click them to test night vision, super speed, spiderweb, flight, decrease or increase and so on. Each feature is attached to a specific character and is available only to him. 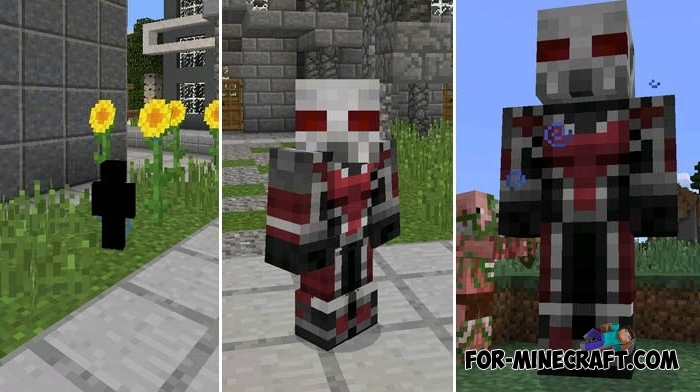 This mod is compatible with MCPE 1.2 and earlier versions for Android, iOS and Win10. Do not forget to update the BlockLauncher before proceeding with the installation. How to install the Pocket Heroes mod?